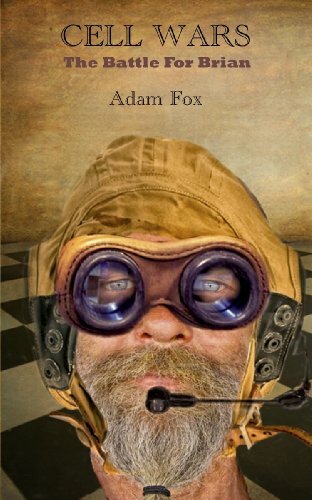 Adam Fox is a new name in fiction, but not a new face. More about that later. One thing's for sure, he brings a unique approach to the subject of health and lifestyle. You wouldn't expect to read a novel about what goes on inside you, but now you can. And hopefully, Cell Wars - The Battle For Brian is just the start of a series that has echoes in the much-loved works of Terry Pratchett and Lewis Carroll. Perhaps you weren't aware that inside everyone on the planet is a team of minuscule "protectors" who are - or should be - totally dedicated to making sure everything is in good working order. From your heart to your liver, your brain to your, ahem, naughty bits. Call them angels if you like, although some of them behave in very un-angelic ways. So when Brian Davis, a stressed junk food-eating accountant from Watford, UK, puts himself in harm's way thanks to some lax habits his "protectors" are suddenly thrown into a bit of a tizzy. And when a nest of cancer cells is discovered down near Liver Central, flat panic sets in. "The idea isn't unique," confesses Adam. "As a child I loved the Beano's Numskulls, tiny folk who operated inside someone's head, and there have been two SciFi films (Inner Space and Fantastic Voyage) that take place inside a body. "But as far as I know, my treatment of how the body works is most definitely unique as far as literature goes." Fox insists his novel is intended to be fun and educational, though he expects some criticism for treating the subject of cancer with humour. "A sensitive subject," he admits, "and one which may be encountering an attitude shift as far as the causes of cancer and its treatment are concerned." Right at the beginning of this article on Adam Fox I stated that his is a new name in fiction but not a new face. Well, Adam Fox and Alistair Forrest are one and the same person writing in different genres. Therefore both are journalists, editors and authors. Clever blighters of course, but modest. Their books are listed for your online shopping requirements on the right. And both live with the same woman. Lucky girl.